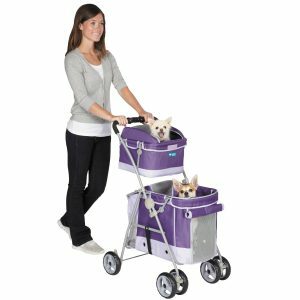 The Guardian Gear Double Decker Pet Stroller is perfect if you share your life with more than one dog or cat, and would like to take them out at the same time. I have a wonderful stroller I bought for my senior dog Red, but now that my young dog Jack has had spinal surgery and can’t walk, he’s been using it. I have been thinking of getting a double stroller so both can fit comfortably, but separately. This one caught my eye for many reasons. I thought I would share these features with you. The double compartment means you can bring at least two pets (more depending on their size) out and about with you. 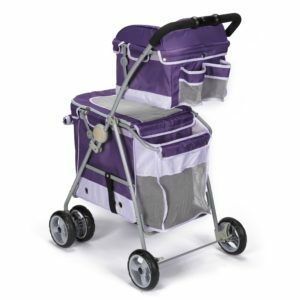 While many single strollers have room to accommodate more than one pet, if they don’t get along that well, or prefer their own space, the separate compartments on a double decker are ideal. Another key feature is ease of assembly. I am hopeless at putting most things together (mainly from lack of patience or interest), so having a stroller that I can easily put together is a definite bonus. This point is often commented on by other purchasers as well. Two storage pockets on the back of the top compartment (suitable for things like water bottles for instance), and a larger one on the back of the bottom compartment. I found 22 customer reviews at the time of writing and they had awarded the Guardian Gear Double Decker Pet Stroller 4.4 stars out of a possible 5 on average. The only reason this stroller did not get a perfect rating, is because one user put a 28 lb dog in the bottom, then commented the fabric started to tear after a couple of uses. When considering a stroller, if you have a dog at the upper limit of a recommended weight, I advise buying the next size up. As someone who has always had multiple pets, having a double decker stroller, like the Guardian Gear Pet Stroller, is the solution. How much easier it would have been if I had it when I was taking my 5 foster kittens and mama cat back and forth to the shelter. It would certainly be the perfect solution for my 10 lb 15 year old blind Chihuahua/Min Pin, and my 12 lb Maltese who is recovering from spinal surgery. Especially because my Maltese is always happier traveling solo!! Almost every real buyer of this product is extremely pleased with their purchase, and would recommend this pet stroller to others. This seems like a great product, and I agree with your suggestion about buying the next size up when your dog is a bit heavy for the size you are eyeing out. Thanks for sharing this product. 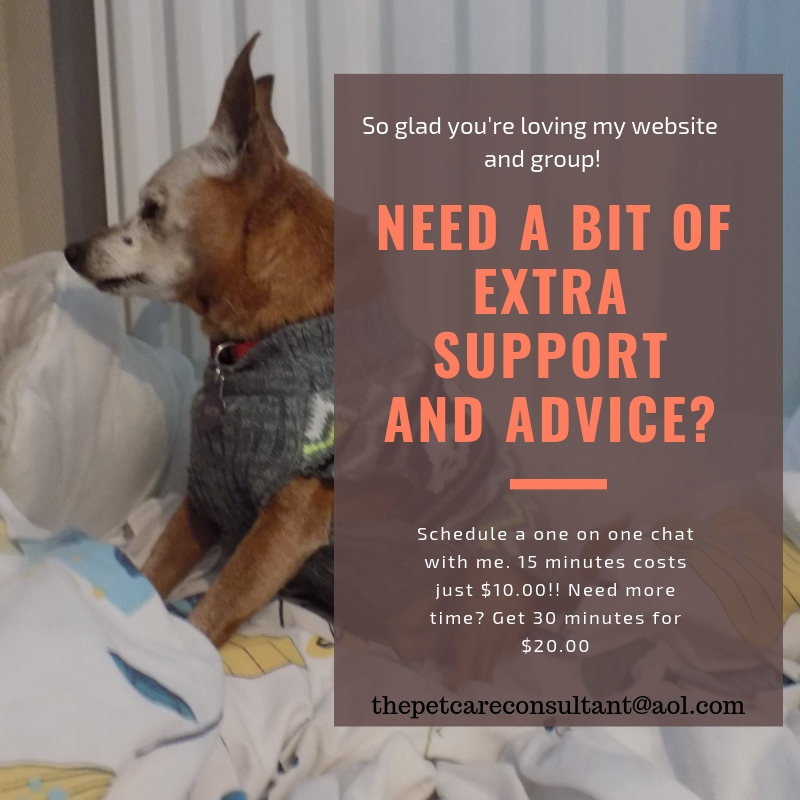 It’s a great product when you have multiple pets, or even just one who has lots of supplies!! I often read complaints about fabric ripping on strollers, or problems with wheels, then you see their dogs are either the exact weight recommended, or a few pounds over. It’s always best to buy the next size up in those cases, so your pets have room to stretch out, and your stroller will last longer.